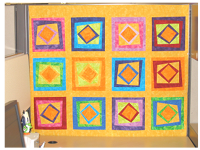 This is the first quilt I ever made, and is about 3 feet x 5 feet. Most of the blocks are traditional blocks, but I designed the top-right block and the middle one in the second row myself, and Rob designed the right block in the 2nd from the bottom row. He also pieced that block. 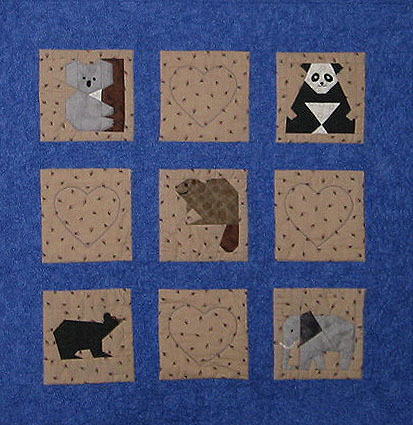 The middle block in the quilt is usually called "Jacob's Ladder," but I chose it because the book I was using for block patterns called it "The Tail of Benjman's Kite" (although I think I reversed two of the squares). Miranda and Prissy putting the finishing touches on the quilt. If you look all the way on the right edge of the quilt you can see a little of the quilting around the border. 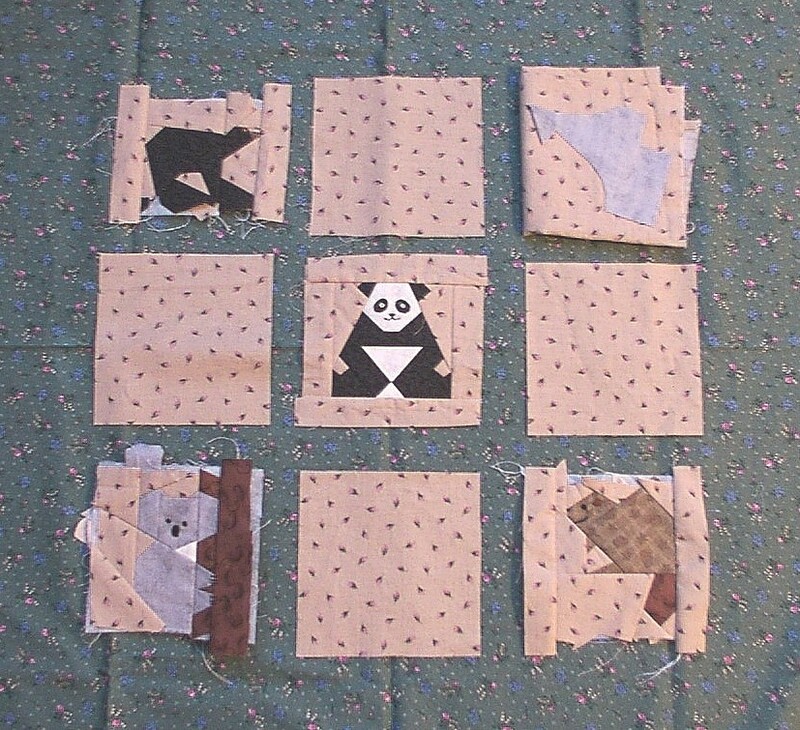 I really enjoyed making the quilt for Benjamin, but it was a long project, and I was sad to not be able to see the finished results very often. So my next project was smaller and for myself - a pillow cover for the couch. 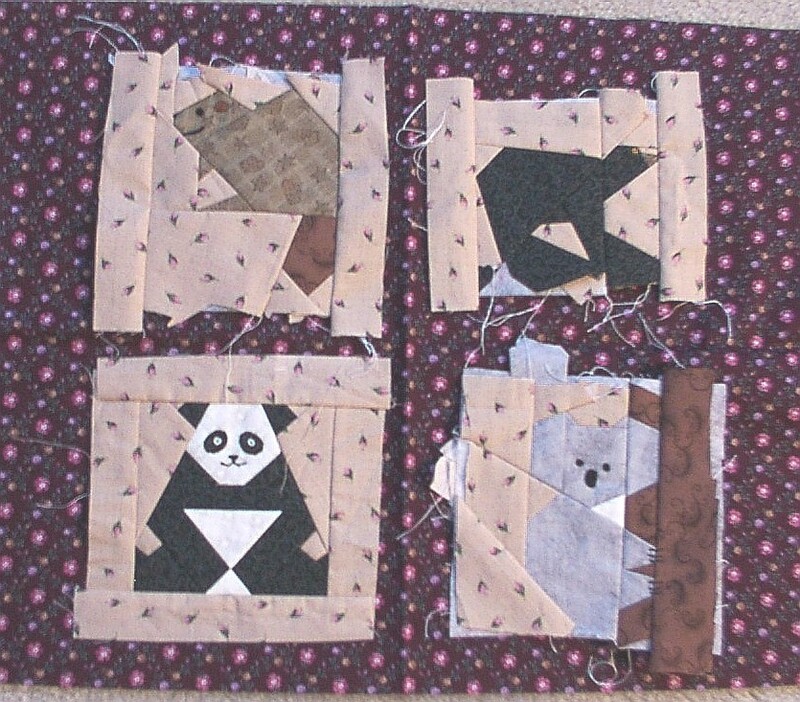 I also used this project to practice hand-quilting, which was nice to do on flights to and from San Francisco. The quilt is about 24" square. A photograph of the quilt. You can see the overall pattern very nicely, but the colors came out rather dark, and you can't see the quilting at all. 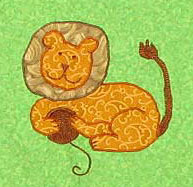 A scanned section of the quilt. 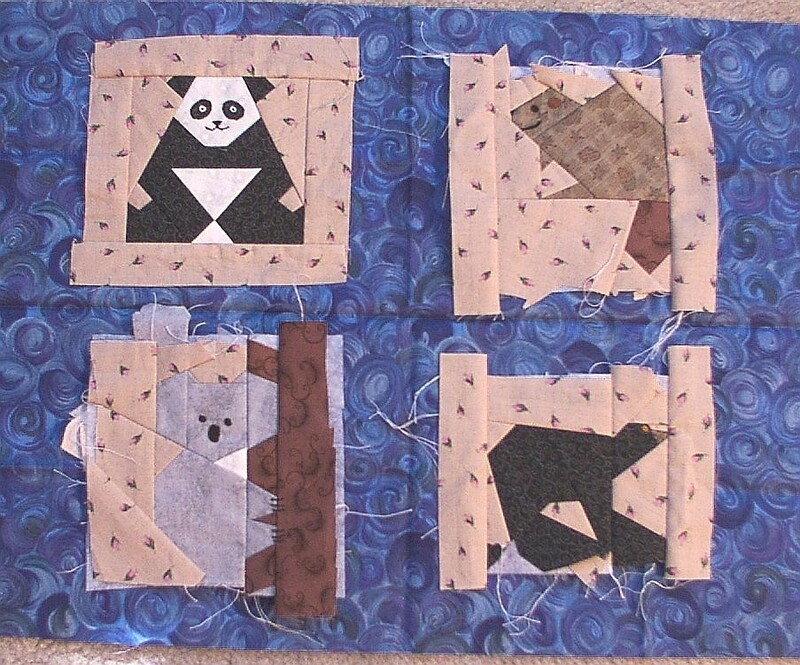 You can see the hand-quilting, the patterns of the materials, and the colors are better (but still a little dark). 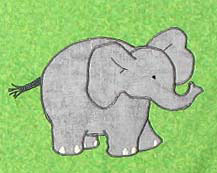 Another scanned section of the quilt. 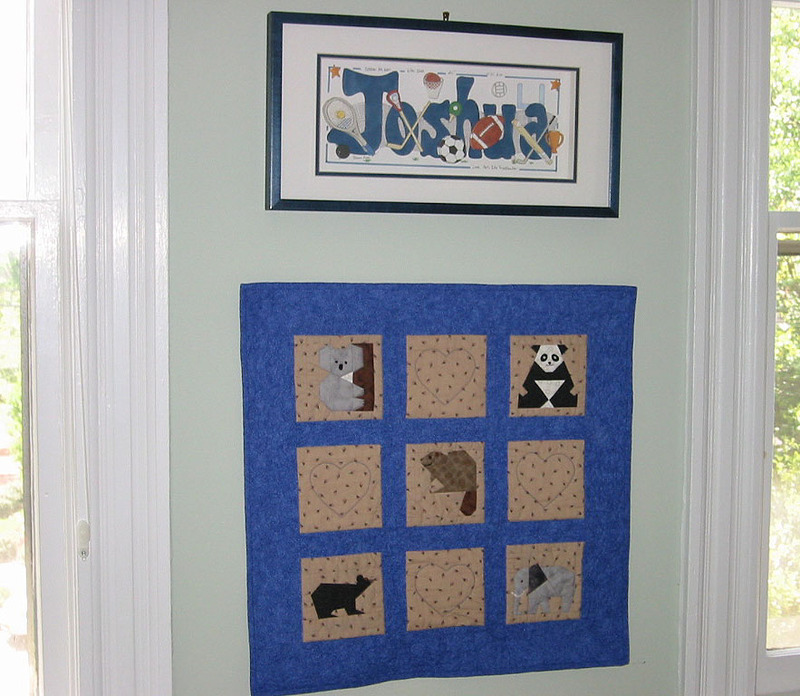 My third quilt was for my friends Chuck and Gretchen, and their baby Scott. 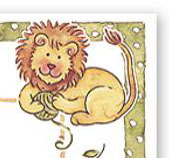 The animal patterns were all taken from A Quilter's Ark, but the coloring and selection of materials is my own. The cat block is meant to look like their cat Kibbles, and the dog block like their dog Fred. 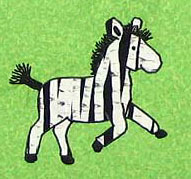 Rob helped out once again by piecing the Fred block, and he also embroidered Fred's nose and eye. This quilt ended up being about 28" square. Small scanned image of the quilt Once again, the colors are a little dark, but not too bad. 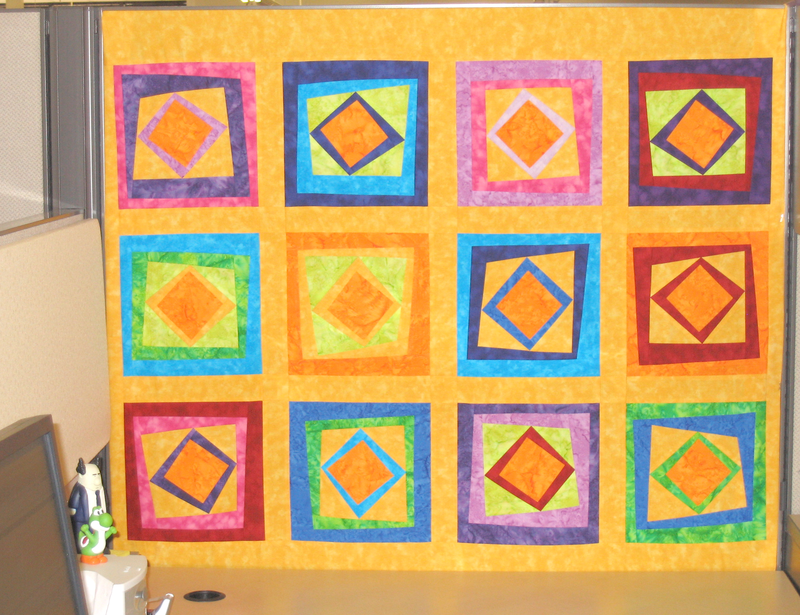 When I was making a quilt for my nephew Nicholas I had a lot of brightly colored prints around, so I decided to make a quilt with a simple pattern, but lots of bright colors (especially to contrast Benjamin's quilt, which has somewhat sombre colors). All of the blocks are Ohio Star, and I think the finished size ended up being about 30" square. I forgot to take good pictures before I sent it to Denver, but I have enough candid pictures taken that week to give an idea of what the quilt looks like. 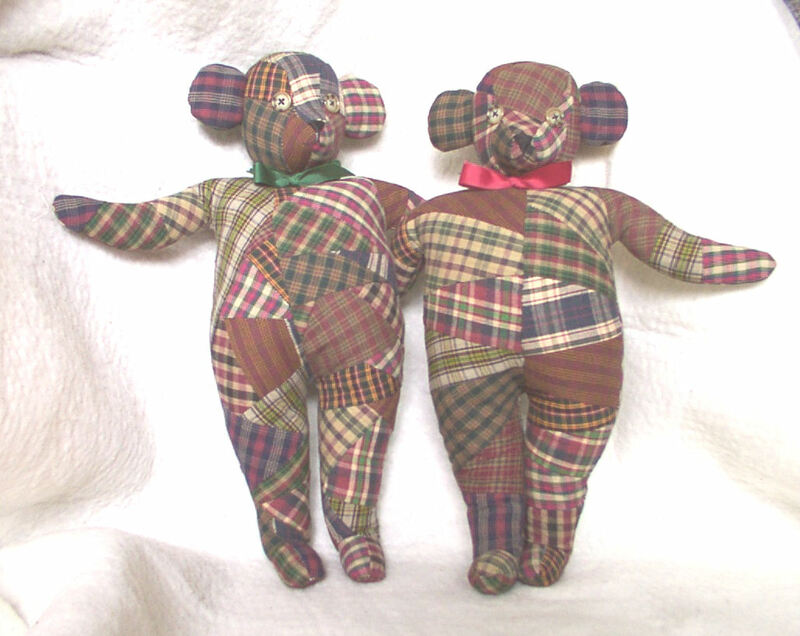 I made teddy bears for Ben and Nick from a pattern in a book Gillian gave me. 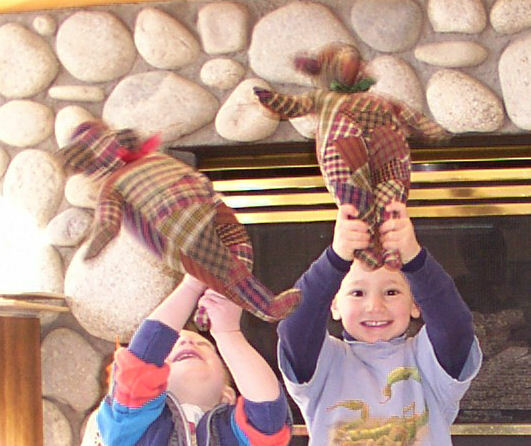 The pattern was terrible, but the bears are still pretty cute. 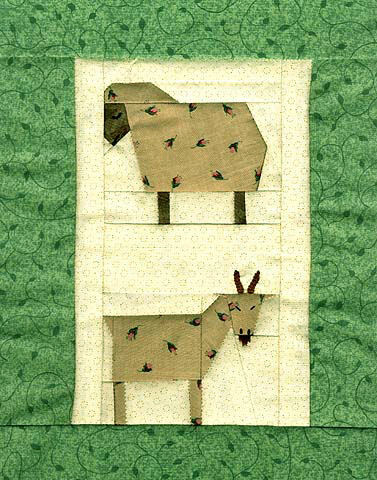 My sister Gillian wanted animals for Josh's quilt, so she got animals. 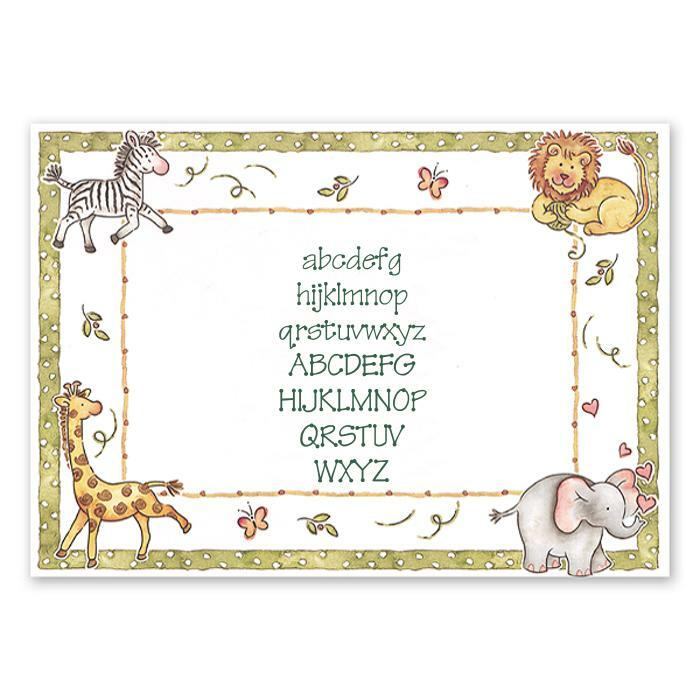 I didn't have a badger for the Wisconsin fans in the household, but I picked a bear, an elephant, a panda, a beaver, and a koala from A Quilter's Ark. I tried several other background fabrics from my stash, and even bought a green for the project, but they were all too drab or just wrong. So I took the finished blocks to the store, and several people in the store thought this blue would be bright and cheery. 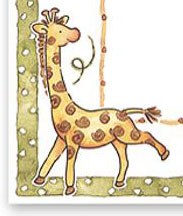 For my friend Amanda I used animals again to make a small wall hanging. Gillian wanted animals again for Maya, but she requested that I match the animals to the announcements she had picked out. 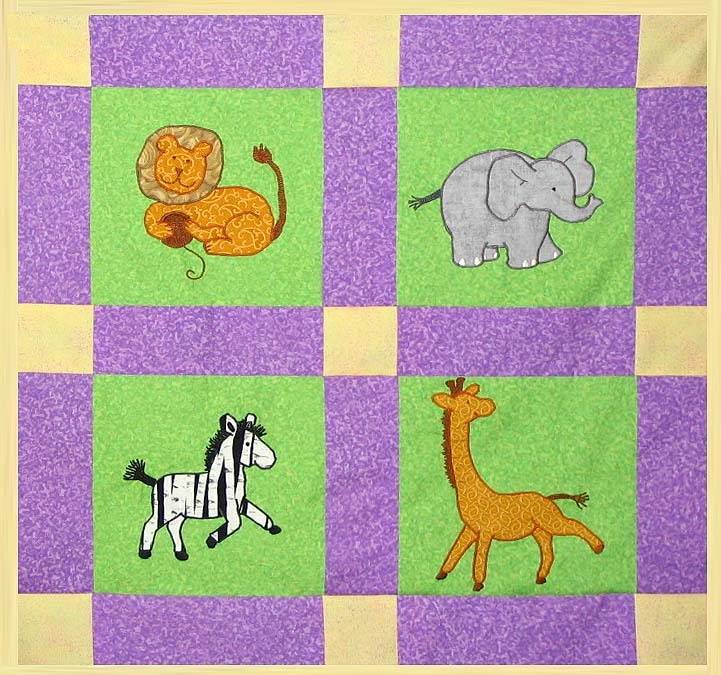 So for this quilt I made applique versions of the cartoon animals on the announcement, which was my first experience with machine applique. 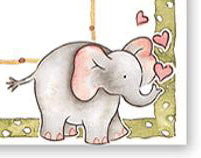 I also embroidered a rose (for Maya Rose) being held in the elephant's trunk. I'll get some good photos of the finished quilt to post here. The quilt top, before it was quilted. 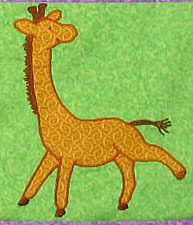 Here's a comparison of each drawn animal to its final appliqued form. Long before I had an iPhone, I had a Sony Clié. I didn't like the leather case that came with it because it was too heavy and big. This case has cardboard to protect the screen, and the Clié slides in and out very easily. It actually fits all the way inside, I just pulled it out slightly for the photo. 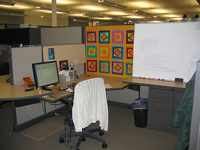 The cubes in our offices were rather drab, so I wanted a quilt to add some color. This is a pattern called Bibbidy Bop, although I simplified it a little. 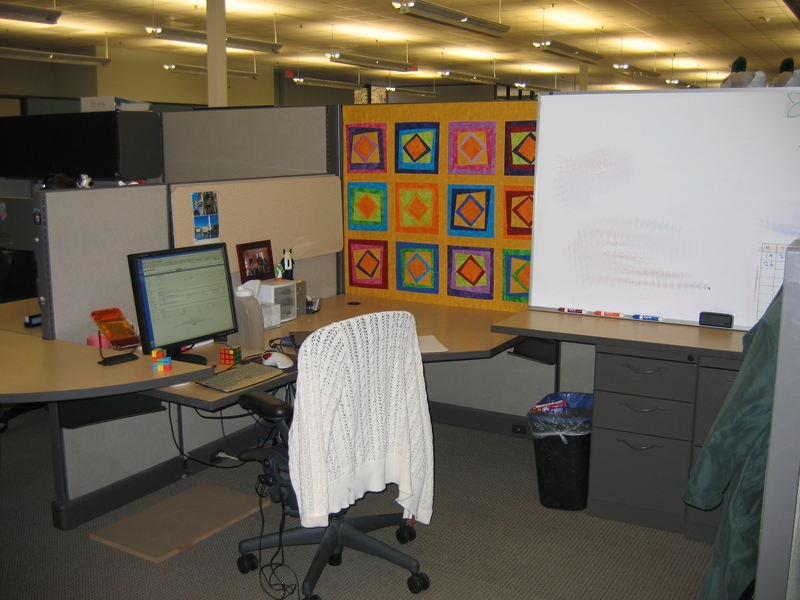 Technically, it's not a quilt because there is no batting, it's just a pieced quilt top that I've pinned to the cube wall. The fabrics are a combination of Moda Marbles, Timeless Treasures Java Blenders, Hoffman Bali Batiks and Robert Kaufman Marbleous.